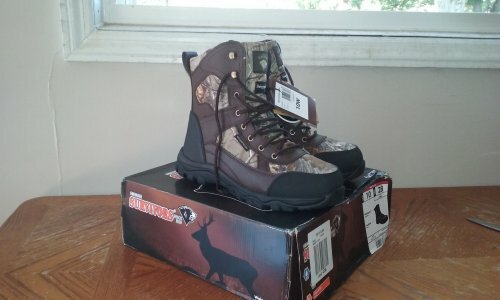 My old boots were broken, so I ordered new boots. They’re Herman Survivors. I don’t know anything about the brand, but I tried them on and they’re comfortable. Bow season starts tomorrow. I probably won’t be out everyday, but I’ll be out as often as I can. Still need to clean up the shack a bit. I want to get rid of the green lumps on the ceiling that I hope are not in fact wasp nests. The balls of hair on the floor, I think that might be a mouse nest. In any case, it’ll be thrown out. Going to the hardware store today to get my license and kill tags. I’m going to get a buck tag and a doe tag.